Description: Now you can monitor your critical financial information in a single report! 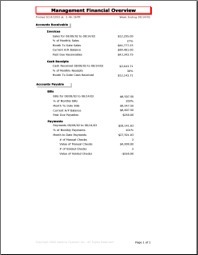 This report provides a weekly and monthly summary of your Vista financial data, including billing, cash receipts, AP Invoices and payments. Description: This report is an operation manager’s dream! 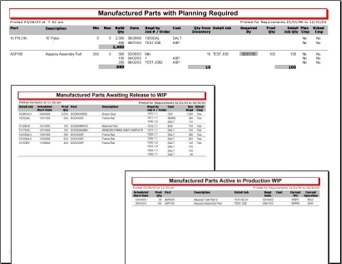 Monitor all your shop’s production information with this report, which displays summaries of quoting, orders, shipping, jobs, labor, purchases and inventory. Description: Bundle the reports listed above for additional savings!. You would have to run almost all of the reports in Vista to get the information available from this pair of reports! 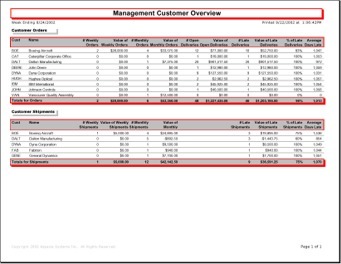 Description: Now you can manage your customer performance in a single report! 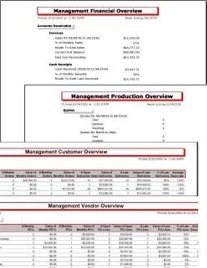 This report provides a weekly and monthly summary of your Vista customer data, including orders, shipments and late delivery performance. You would have to compile the data from at least 4.. Description: This Vista report is an operation manager’s dream! 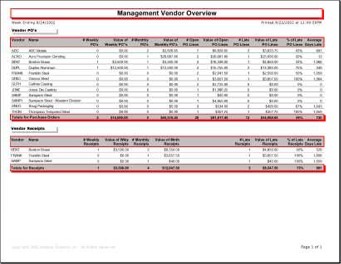 Monitor your vendor’s delivery performance information with this report, which displays summaries of open and past due purchase orders and delivery performance. Also exports to MS Excel. 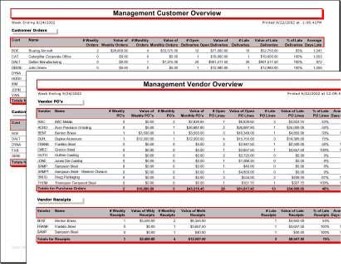 Description: Bundle the Management Customer Overview and the Management Vendor Overview reports for additional savings! 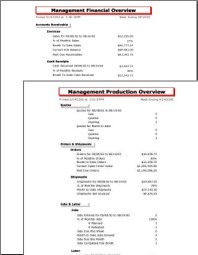 Description: Bundle all of the Management Overview Series for additional savings!. You would have to run almost all of the reports in Vista to get the information available from this pair of reports!